Gatlinburg and Pigeon Forge are family-friendly towns with numerous attractions for kids. Getting outdoors is easy too, with the Smoky Mountains all around. Here are some of the activities for children in the area. Riding up and down the mountain is an easy way to see the scenery. The Gatlinburg Sky Lift takes a parent and child seated together up to the scenic overlook on Crockett Mountain, with snacks and telescopes waiting, and one of the best panoramic views of Gatlinburg and the surrounding Smoky Mountains. Another great ride is the Gatlinburg Mountain Coaster. Fun, safe and silent, you can even control your own speed in the single and double rider carts. Open year-round, this ride coasts downhill through mountain scenery and is fun for all ages. You can also hop aboard the 120-passenger Aerial Tramway, which departs regularly from downtown Gatlinburg to Ober Gatlinburg Ski Area and Amusement Park. At Ober Gatlinburg, you can shop or go ice-skating in the indoor mall, visit the restaurant and lounge, or for more elevation take the ski lift up the mountain, in summer as well as in winter. Several indoor and outdoor miniature golf locations are available where kids can attempt to sink a putt on some very fanciful courses. Many of the venues include other games and activities such as bumper cars, laser tag and other theme games, and black light golf courses. Fort Fun in Gatlinburg – just down the road from the Sky Lift – has an impressive “Under the Sea” black light course, featuring dolphins, mermaids and maybe even a pirate ship. See our guide to more Mini Golf Courses in Gatlinburg & Pigeon Forge. Check out our guides to Whitewater Rafting and also River Tubing on the many waterways of the surrounding Smoky Mountains. 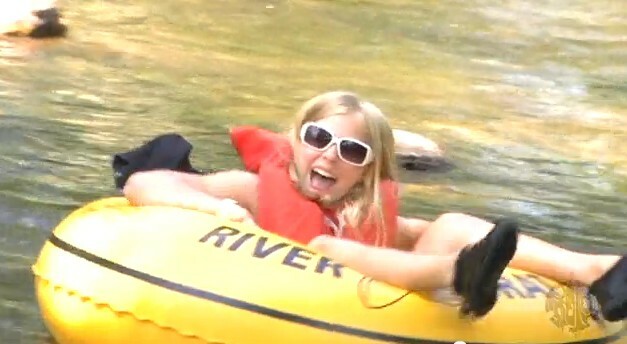 You’ll learn the difference between the Little River, the Little Pigeon River, and Pigeon River! Each one is best for certain activities, and typically no experience is necessary. Take your choice of a thrilling trip through roaring whitewater or a gentle stream drifting downriver. 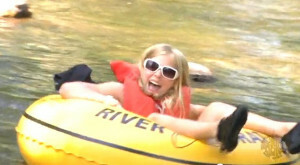 The Smoky Mountain scenery is beautiful from the river and some of the water is lake-fed (cool in summer) and controlled-release, making it easier and safer to enjoy a thrilling time with the whole family. Swimming opportunities are plentiful. The varied terrain of the Smokies offers excellent diversity for horse riding. You can explore scenery that you can’t drive to, that you would prefer not to hike to, and that simply views best from the back of a horse. Stables offer many trails to suit the whole family. You can find carriage rides, hay rides, singing cowboys and bonfire suppers. Check out our guide to Riding Stables and Horseback Riding in the Smoky Mountains, and note that we offer a Free Ticket to Waldens Creek Stables. There’s horse riding available in Cades Cove also – see our definitive Guide to Cades Cove for more information. Kids love to climb, and there are many ways to get off the ground in the area. Despite how it looks, ziplines are safe for even quite small children and somewhat elderly people, which makes it a family-inclusive way to see the scenery of the Smoky Mountains in ways that only birds used to get. Check our guide to Ziplines in Gatlinburg for the whole area. We also offer a Free Ticket to Legacy Mountain Ziplines. 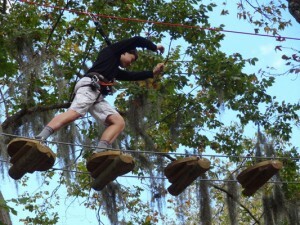 Ropes courses are popular, and a lot of the zipline venues offer these too. 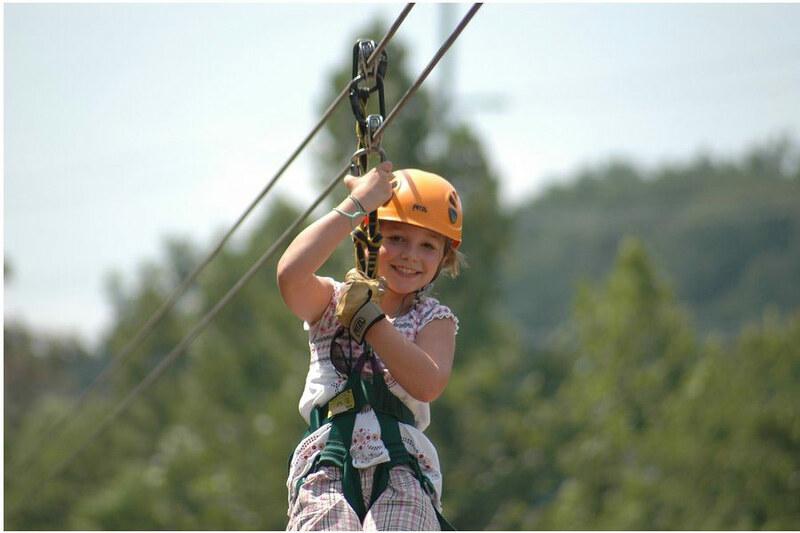 One of the very best ropes courses for kids and adults in the Smoky Mountains – and one we offer a Free Ticket for – is Adventure Tree Tops Ropes Course just outside of Pigeon Forge, in absolutely beautiful acreage. There are bridges, decks and platforms – and of course, ziplines – so all the kids, young and old, can spend hours off the ground. This venue also has horseback riding, so you could spend a whole day there. Not all the kids adventures are outdoors of course. If the weather says find an indoor attraction, check out our guide to some of the Top Things To Do With Kids in the Smokies: Fun & Games. TIP: Did you know that we offer a coupon book to our guests worth more than $400 in free tickets to many of the best attractions in Gatlinburg and Pigeon Forge? See the full story in our Gatlinburg Coupons page.